Deb Kozak and Karen Hamling traveled 3,866 kilometers to meet Ottawa ministers. She could tell they were paying attention because they weren’t fiddling with their cell phones. Nakusp Mayor Karen Hamling had travelled nearly 4,000 kilometres to discuss the potential impact the renegotiation of the Columbia River Treaty could have on her small community with four federal ministries in Ottawa. Accompanied by Nelson Mayor Deb Kozak, she’d made the trip to impress upon the federal government the importance of including local communities in the conversation. “It went so well, it was beyond my expectations,” Hamling told the Star. At its most basic, the CRT is an agreement between countries in which the U.S. compensates Canada for the privilege of damming the river north of the border to provide flood control, hydro-power efficiency and water for irrigation and other consumptive use in the U.S. Approximately 15 per cent of the Columbia River watershed is in Canada. On top of the lump sum received in 1964 when the treaty was signed, the province receives an annual payment into its general coffers. Last year BC received $130 million as part of the agreement, with slightly less expected to come in 2017. But there were a number of things not addressed by the original treaty, including First Nations rights, environmental issues, wildlife habitat, and the salmon fishery. According to the treaty either Canada or the U.S. can mutually agree to change it any time. They can terminate most of the provisions any time after Sept. 16, 2024, as long as a year’s notice is given. But many spectators believe renegotiation is coming soon. 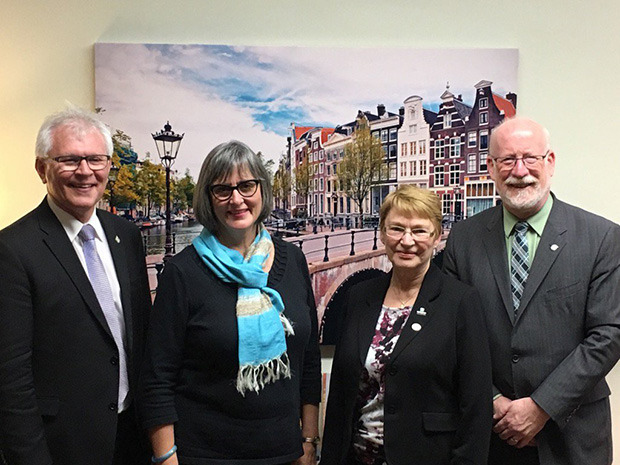 Hamling and Kozak met with the Ministries of Indigenous and Northern Affairs, Global Affairs, Environment and Fisheries and Oceans. And Kozak was floored by the warm reception they received. “The people in Ottawa were impressed and I’d say extremely respectful of the fact two mayors of local governments in BC showed up to speak with them. That doesn’t happen often,” she said. While in attendance, the mayors described the past six years of advocacy work and relationship-building they’d embarked on, which culminated in a formal set of recommendations that have been approved by the Province of BC. They described how they’ve built relationships with BC Hydro, municipalities in the U.S., First Nations groups and the provincial and federal governments. They’re doing all of this to ensure they end up with a better outcome than last time. “We are building legacies like the Columbia Basin Regional Advisory Committee who work with BC Hydro and most recently a Lessons Learned Project with a graduate student of UBC,” said Kozak. And what is it they want heard? For one thing, Hamling isn’t thrilled about the plummeting lake levels in her town caused by activity south of the border. She said they have often seen a drop between 40 to 70 feet, leaving vast stretches of mudflats. “My personal belief is the Americans need to do what we’re trying to do, and use the water more wisely. She also wants to see the fish come back. Kozak thinks Kootenay residents need to start getting engaged in the process, because the result of the renegotiation could have an enormous impact. And the local community has a huge role to play, she said. “This river produces up to 50 per cent of the power production of BC. The combined power of the Revelstoke and Mica dams is equal to five Site Cs, and that’s only two dams in our region. Neither Hamling nor Kozak have any idea how to predict how things will go. Their set of recommendations could be ignored by the U.S., who have already made noise about backing out of some of their financial obligations. An American negotiator has been named, but hasn’t yet been given a mandate. “Donald Trump’s going to be the next president and you want me to make a guess on anything?” said Hamling. “I think we’re going to have really interesting times ahead. What I can ensure everyone of is that the local government’s committee, we’re not going to let this drop. We’re going to keep this on the forefront.